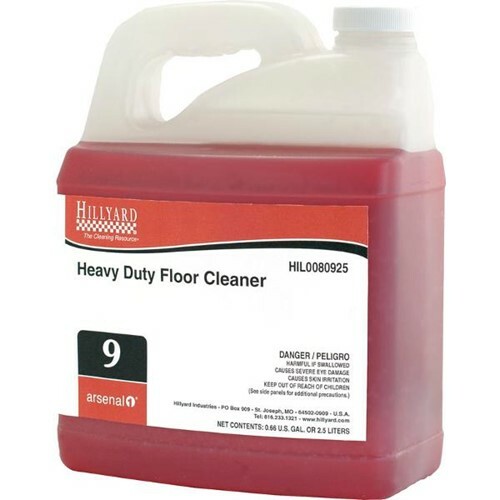 Home → Chemicals → Hillyard, Arsenal One, Heavy Duty Floor Cleaner #9, Dilution Control, HIL0080925, Four 2.5 liter bottles per case, sold as One 2.5 liter bottle. A concentrated, multipurpose cleaner formulated to efficiently remove a wide variety of dirt, grime, and grease. It can be used for cleaning any hard surface not damaged by water, including resilient tile, concrete, paver brick, and quarry tile. Dilution rate 1 oz per gallon.